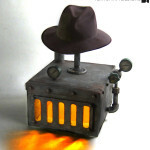 One, two… Freddy’s coming for you! 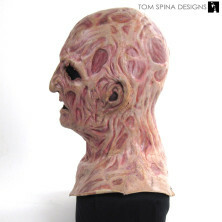 A custom foam bust for a screen used foam latex Freddy Krueger prop mask. 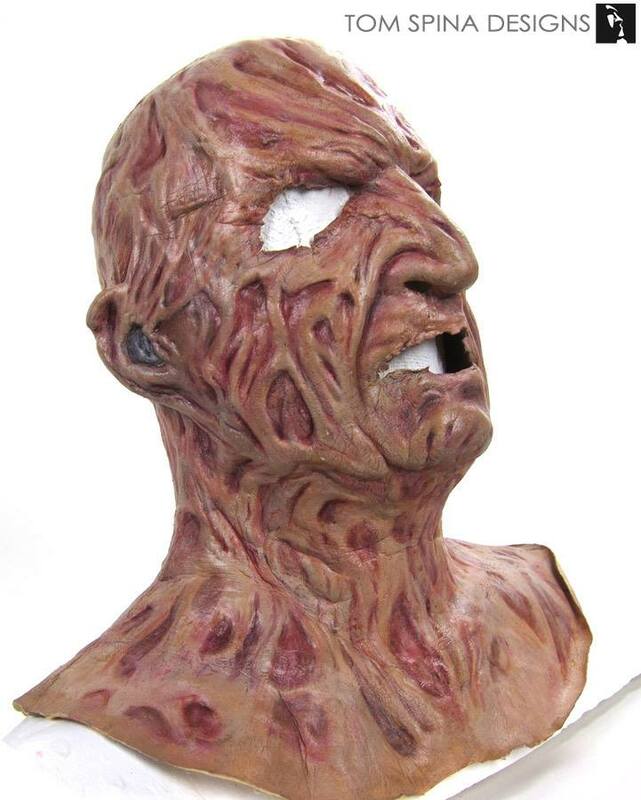 When this Freddy Krueger prop mask arrived in our studio he was in very good condition. 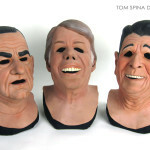 However the fragile foam latex mask was not being well supported. 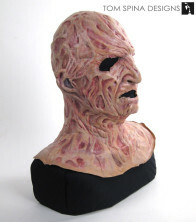 Over time, lack of support can cause a foam latex movie prop mask to stretch and droop. It was also on an unsealed plaster bandage bust, which could absorb precious moisture from the foam latex. 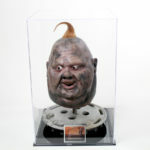 It was important to get this mask onto a proper display form to help preserve it in the future. Our studio artists created a custom support bust that form-fit to the insides of the screen used Freddy mask. This custom insert was made to fit inside the mask to give support with out any unnatural stretching, and hold the head and shoulders of the Freddy mask while the prop was on display. 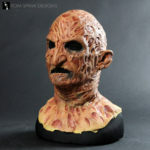 The eyes and mouth area, as well as the shoulders and bib are all covered in black fabric, keeping this foam latex Freddy mask as original as possible. 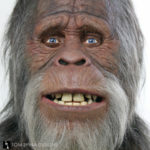 Another option would be to add eyes and teeth to the display, making a more realistic life-sized bust from the prop, but each client has different preferences. In this case, our client wanted to showcase the Nightmare on Elm Street mask as the movie-prop that it was, rather than as the character of Freddy Krueger. We always look forward to discussing options and ideas with our clients when each new project begins.